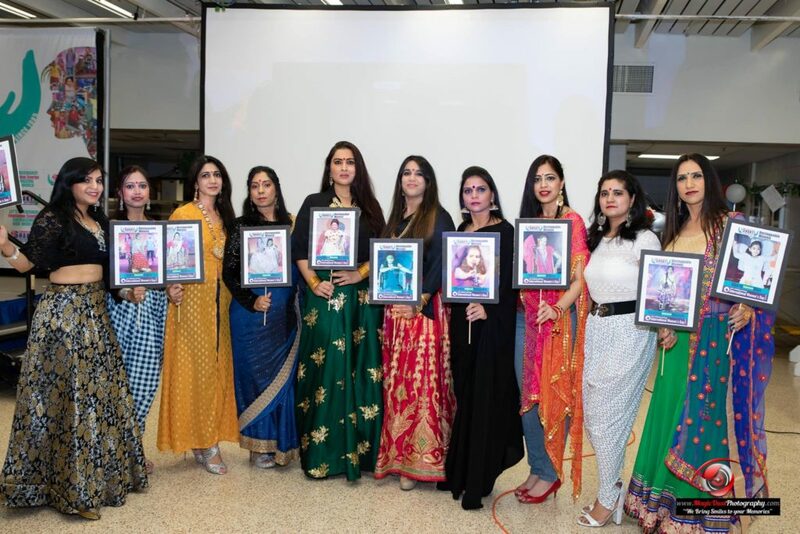 Atlanta, GA, April 3, 2019: Narayan Seva Sansthan (NSS), an Udaipur based NGO known for rehabilitating differently abled people from the underprivileged segments, women in particular, celebrated International Women’s Day on March 8, 2019 by recognizing 22 Atlanta women with Shakti (Feminine Energy) awards. 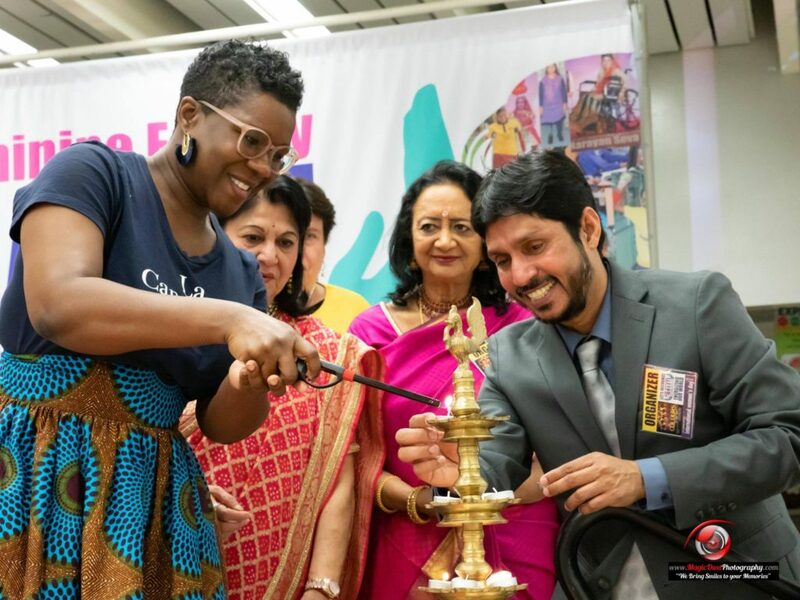 Held at Berkmar High School, the event also featured a breathtaking production by Padmabhushan Dr. Mallika Sarabhai, Colours of Her Heart, that showcased the pain, travails and victories of women across all nations. “Unstoppable Women Fashion Show”, dedicated to differently abled fashion show artists in India highlighted the resilience of women who pursue their dreams despite their disabilities. Award presenters included Consul General Dr. Swati Vijay Kulkarni, Nadia Theodore, Consul General of Canada in Atlanta, Alicia Philipp, Community Foundation of Greater Atlanta and Madhu Sheth, The Sheth Family Foundation along with guest panel of Mustafa Ajmeri, Dr. Paddy Sharma, Dr. Jag Sheth, and Alex Patel of Sai Peace Center. Consul General of Canada, Nadia Theodore and Manoj Barot light the ceremonial lamp as Madhu Sheth and Dr. Paddy Sharma look on. Manoj Barot, Executive Director of NSS was joined by the women guests for the traditional lighting of the lamp. Emcees Kim Yang and Christina Porter anchored the proceedings with grace and smile. Predominantly themed to showcase the strength of women within, the inaugural awards opened with a unique fashion show that was a representation of ten differently abled girls in India who make the outfit themselves and display it and have participated in one of the many fashion shows hosted by NSS. Conceptualized and choreographed by Swati Thakur and co-coordinated by Hetal Mehta, the show featured ten Atlanta women representing each of the girls in India, holding a picture board. “I’m very pleased that more than 450 people showed up in support of these women who are performing well professionally and contributing to the community immensely,” said Dr. Jag Sheth. “When we decided to launch the very first NSS ‘Shakti’ awards 2019 in Atlanta, we knew it was important to recognize women who energize our world,” said Prashant Aggarwal, Global President, NSS in a video presentation congratulating all awardees. “For Narayan Seva Sansthan, ‘SHAKTI’ (Feminine Energy) is always at the heart of their efforts as they work to transform the futures of young girls and women through no cost surgeries, vocational trainings and educational programs. The idea was to recognize women who are dedicated and involved in women empowerment activities, trail blazers and seek careers beyond routine careers, dedicated in imparting culture/performing arts alive for the future generations or taking initiative for women’s health and wellness,” said Barot. AVs of awardees played along as the awards were handed out, with each receiving a booklet listing the inaugural Shakti award recipients and their accomplishments. 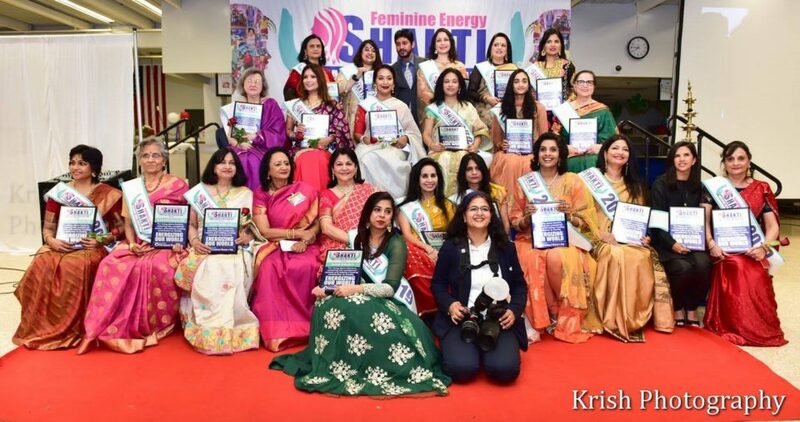 Sasikala Penumarthi, Academy of Kuchipudi Dance for Culture/Performing Arts, Vibha Rustagi, Itaas, Lata Chinnan, Entrepreneur/First Women’s World Cup, Lakshmi Thesam, IFA, Sheetal Desai, The Trusted Lawyers, Sucheta Rawal, Go Eat Give in the Trailblazers category, Asha Parikh, MD GA Clinic/Emory Hospital, K.Sujatha Reddy, MD SAI Health Fair, Sujatha Reddy, MD Premier Care For Women, Susmita Parashar, MD Emory University, Annapurna Bhat, MD Piedmont Henry Hospital for Women’s Health/Medical, Suzanne Sen, Khabar, Jyothsna Hegde, NRI Pulse and Anjali Chhabria, TV Asia for Media, Ami Patwa, Gokuldham in the Great supporters category and Navya Sarikonda, Author in Young Achievers category. 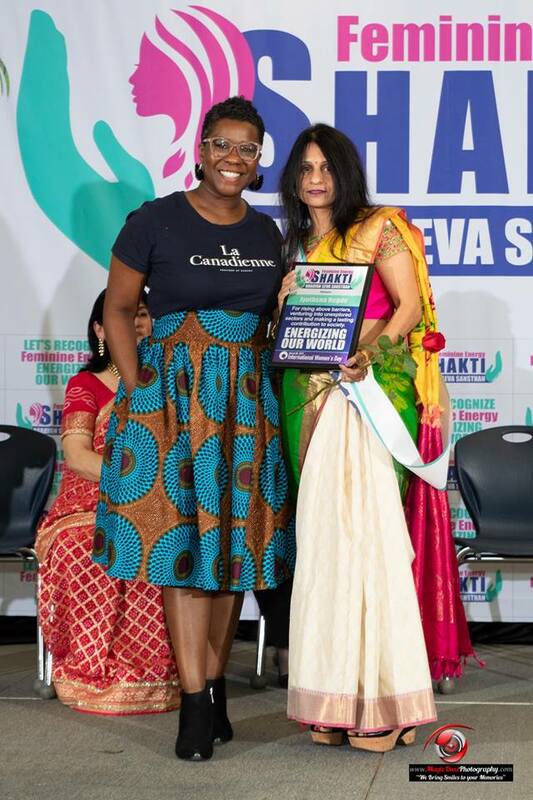 NRI Pulse City News Editor Jyothsna Hegde (right) was among the trailblazing Atlanta women to be honored with the NSS Shakti Award. An apt show perfectly complimenting the occasion was Sarabhai’s Colours Of Her Heart rooted in classical but cleverly adopted to modern day issues in contemporary costumes, lighting and choreography. The dance-theatre multimedia amalgamation of emotive segments, monologues, solo and synchronized group performances with bilingual live music by talented England-based singer Samia Malik and story creating skills of Yadavan Chandran emerged beautifully to create a six-women show that highlights the process of healing by not concealing but confronting one’s darkest fears. The production touched upon ways women are shackled in social norms of good and bad girls, or when a girl is alone at night, or told to adjust, or keep silent in Ek Shaher, Raat Me Akele Mein, Adjust Kar Le, Chup, and Sheher. Sarabhai also presented actual cases of harassment including her own along with Surbhi, Mehraj, Sonal and Pooja. “It’s not the color of her heart, It’s the color of her face. It’s not the whisper of her dreams, it’s the roar of her race,” concluded the powerful piece. Introducing the NRI Pulse Video News Bulletin! !